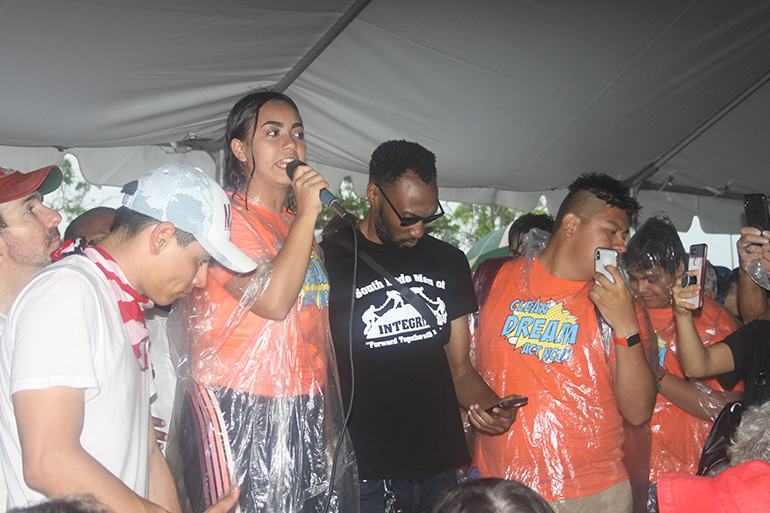 Young "dreamers" and activists speak in favor of the Deferred Action for Childhood Arrivals (DACA), after a protest march in Homestead in June of this year. The marchers were protesting the "zero tolerance" policy of separating families at the border in front of the U.S. government's emergency shelter for unaccompanied minors. MIAMI | Jensy Chacon turned 6 during her journey with her mother to cross the border from Mexico to the U.S.
She doesn’t remember much of the exodus, which started in her native Honduras. “I only remember crossing a river on a tire, and then Immigration caught us,” said Chacon. One of her clearest memories is arriving by bus to meet her father, who was already living in Miami. Since then, she said, she grew up fearing the police because they could deport her or her parents. Last June, she graduated from high school. She passed the Certified Nurse Assistant exam and already works at a local clinic, but she dreams of studying medicine at a university. That dream came nearer to fulfillment after she enrolled in the Deferred Action for Childhood Arrivals (DACA) program, which protects her from deportation, and also gives her a social security number, a state ID or driver’s license, a work permit and health insurance. Chacon said she feels more at ease, but adds that even as a beneficiary of DACA, she still needs to pay college tuition out of pocket because she does not qualify for government financial aid. “At least I have something that will let me stay here and go to school. If I didn’t have DACA, what would I have done?” she said. But she is worried about the future of the program, which was rescinded by the Trump administration in September 2017, with re-enrollments ending this March. Whether or not the program will remain rescinded is a question now before the courts. Lawyers for DACA recipients – about 700,000 so-called “dreamers” – have filed lawsuits arguing that the cancellation of the program violates the Fifth Amendment, which states that the law must protect everyone equally. Opponents argue that the program is unconstitutional because President Obama abused his executive power when he changed immigration law without the authorization of Congress. Several courts have ruled that the government must continue processing the two-year renewal requests for DACA recipients, as well as giving work permits to those already enrolled, until a final determination on the program’s legality is made either by Congress or the Supreme Court. No new enrollments are being accepted however. Other cases are pending in New York and California. The program does not provide permanent legal status or citizenship. It only provides protection from deportation for a period of two years subject to various conditions, such as being enrolled in school or serving in the military, and staying out of trouble with the law. The renewal fee is $495 for each two-year period. According to a recent study put out by the University of California, United We Dream, the National Immigration Law Center and the Center for American Progress, 92 percent of DACA recipients are currently employed. With DACA they have been able to attain better paying jobs, buy cars, houses and pay taxes, and generally contribute positively to local economies. According to the same study, 40 percent are enrolled in universities, so losing DACA means less accessibility to higher education. Quiros noted that immigration advocates are also waging court battles aimed at forcing the government to accept new applicants, young people who were either not old enough to apply for DACA prior to its cancellation or could not apply for other reasons. Although not renewing DACA means losing protection against deportation, as well as work permits, about 100,000 DACA recipients have not filed for renewal, many for economic reasons and others out of fear. “They don’t want Immigration Services to have current data on them,” said Quiros. The bishops have spoken out in favor of DACA in addition to urging Congress to pass a just and comprehensive immigration reform.